The Greenstone Slate and SlateTec exhibit in Nashville, all set up and ready for the show to open! 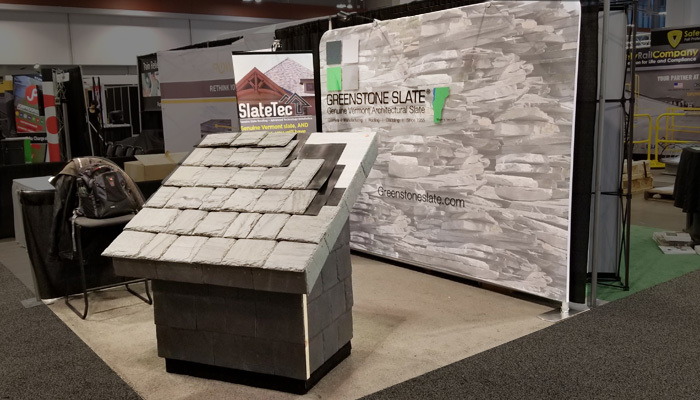 It was a busy February for Greenstone Slate as they traveled across the country promoting the benefits of Greenstone Vermont slate, the advanced technology behind the SlateTec lightweight slate roof installation and HailFire™, Greenstone’s maximum protection roof. First visited was historic Nashville, Tennessee, where they exhibited at the 2019 International Roofing Expo* (IRE) on February 11-13. In addition to educational opportunities, the 14,295 attendees had the opportunity to peruse over 500 exhibitors, which has been declared as the largest show of exhibitors in IRE history. On display at the SlateTec / Greenstone Slate booth was an actual roof section that demonstrates the quality of Greenstone Vermont slate (S-1) as well as how the SlateTec Installation System reduces weight with no compromise in the protection and elegant aesthetics compared to a traditional installation. In fact, the SlateTec technology reduces weight of a slate roof to under 6 lbs / sq ft, and streamlines the slate installation process while enhancing protection from wind, rain and hail. Speaking of the unmatched protection of a slate roof, the roof section display was comprised of all the elements that together form the most durable roof there is — a no-holds-barred roof for residential and institutional applications: The Greenstone Slate HailFire™ Roof. It’s a roof that has simply unsurpassed resistance to impact (hail), fire, desert heat, arctic cold, water, sunlight, bio-growth of any kind, and maybe above all, resistance to time — proven by its 100 year slate warranty. And, while it will likely last longer than any other roof you could buy, its beauty could be called timeless. The following week, Greenstone Slate exhibited at the 75th annual International Builders’ Show** (IBS) February 19 – 21 in Las Vegas, Nevada. Greenstone Slate welcomed the opportunity to again speak with many visitors about the innovative SlateTec lightweight approach to installing a genuine slate roof and the HailFire’s ultimate protection. Some might say the folks from Greenstone even brought the Vermont weather with them, as it actually snowed in Las Vegas during the show! Despite the bizarre weather though, the IBS show organizers wrote that this was their “biggest show in a decade” with more than 100,000 people attending. If you didn’t make it to either show but you would like more information on Greenstone Slate, SlateTec, HailFire or Greenstone Slate Specials, send us a message or call toll free (800) 619-4333. The Greenstone Slate Company is the North American distributor for SlateTec Installation System. *The International Roofing Expo, sponsored by the National Roofing Contractors Association (NRCA), is promoted as the premiere roofing construction and maintenance event where roofing professionals gather to experience face-to-face interaction, product review, education and networking. **The NAHB International Builders’ Show® (IBS), sponsored by the National Association of Home Builders (NAHB), is promoted as the nation’s premier annual residential housing construction trade event for manufacturers and suppliers of home construction products and services.